AFA Gaming returns to go through the history of one of our favorite video game developers, Naughty Dog! From the humble beginnings of Jason Rubin and Andy Gavin's creation of the now iconic Crash Bandicoot all the way to the Naughty Dog of 2018 and their advancements in their game design and animation. 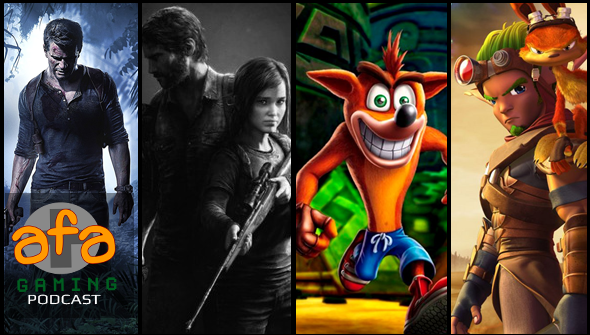 Naughty Dog has crafted tons of memorable moments and innovations in the video game industry, and it is time to discuss why these games have the impact that they do. Want to send us a message, question or suggestion for a future show? Email us at podcast@animationforadults.com. Keep up with Jason Rubin and Andy Gavin on their websites and social media! Game Informer Interviews Josh Sherr on the history of Naughty Dog's animation. Dan of Extra Frames discusses the animation principle of Squash and Stretch and how it was used in Jak & Daxter.